Great photos of all the wheeled equipment in the news/testing lately: Typhoon, Scoprion, Lynx, Tiger, etc. Am I the only one impressed by that Scorpion variant? Both versions of the Skorpion are interesting. Sort of a mini-Tigr. By the way, the Rys (Iveco) is only 1 T lighter than the Tigr. I tought the Tigr was at least a third bigger/heavier. They seem to be in the same class, while the Skorpions are smaller/lighter. NO MORE LYNX WILL BE BOUGHT! Current contract will be completed (it is almost done), and no more will be signed after. • Нашумевший видеоролик, где IVECO в заезде по снежной целине отстает от российских бронеавтомобилей, объясняется просто. Первоначально были закуплены автомобили, не приспособленные для эксплуатации в Российской Федерации, с широким передним бампером, в комплектацию которых не входили защита от снега и цепи на колеса, которые имеются на аналогичных машинах армий Норвегии и Австрии. • Широкий бампер при езде по глубокому снегу создавал эффект отвала, толкающего впереди IVECO снежный сугроб, что приводило к существенному замедлению хода. Автомобиль не завяз, но шел тяжело, рывками. Сегодня для заснеженных районов, в т.ч. и для России, автомобили комплектуются специальной защитой поддона двигателя, выполняющей одновременно функции рассекателя снега, конструкция бампера изменена. • Sensational video where IVECO in the race for the virgin snow behind Russian armored cars, a simple explanation. Originally purchased vehicles, not suitable for use in the Russian Federation, with a wide front bumper, in the box that do not include protection from snow and chains that are on similar machines armies of Norway and Austria. • Wide bumper when driving in deep snow, creating the effect of the blade, pushing ahead IVECO snowdrift, which resulted in a significant slowing down. The car is not stuck, but was hard jerks. Today, snowy areas, including and Russia, cars equipped with special engine undertray, performing both functions chopper snow bumper design changed. If it's true that it's a relatively simple matter to adapt the Lynx to Russian conditions, with mobility not inferior to Russian analogues (at least not too much); then there would be no reason to exclude the Lynx from future contracts; it's being produced in Russia (or will be) and other than the problems with snow - by all accounts it's a capable, proven machine that has been put through its paces in Afganistan. Granted, by the time the next contracts roll about, the Lynx would have the Scorpion and Volk to hold its own against. I'd be most interested in the results then. I have actually seen the snow-bumper thing, but it is a half-assed solution. Why? The Tigr is "half a BTR" chassis essentially. The Lynx has NO WAY of competing in terms of large object clearance, light water fording, and terrain in winter conditions even with modifications. It is simply a fact of physical impossibility. I don't think I need to repost that video from an arms show, where Tigr scales big obstacles, while Lynx drives AROUND them (and needed to be towed once). Then we get to the other major concern - the vehicles were given to Spetsnaz were disliked because they are very cramped, especially compared to Tigr. Geolocator and his Lynx fanboys can say anything they want, the fact remains the guys who operated both vehicles preferred the Tigr and do not understand why it was replaced. What is the point of so many mine protected vehicles whos only real purpose is light transport/liason? They are not adequate for being chassis for special variants, they are not useful as special forces mounts, they are not general troop transports....and if peole really think the Lynx will survive the sort of gigantic mine explosions that took out BTRs in those videos, then well, I have nothing to say. Thanks for your opinion TR1, it seems you are already following that thread. Clearly I don't know enough about this whole issue to justify a firm opinion. I'm fairly neutral in this regard. I just want to see the best vehicle for each niche (general MVD, MVD VV, FSB troops, standard Army, Reconnaissance use, Spetsnaz use). Of course if you give each branch their own specific vehicles - the logistics complications and costs will go through the roof. So in my mind its better to standerdize the vehicles to 2-3 types; perhaps with some small numbers of others for specialized uses. Tigr variants and Lynx need not be in competition. Tigrs can be used where there is more snow or otherwise less mobility. Lynx has greater mine protection; it may not matter most of the time but an IED that would otherwise be powerful enough to blast a BTR-80 to shreds might be blasted somewhat off centre and then a Tigr might shatter while a Lynx might not. Or they could both be blown away but the crew in the Lynx is in one-piece while in the Tigr its in pieces. Bottom-line is that protection is a valuable quality and the more of it the better. I read that the Scorpion has passed the state tests and the Volk is due to undergo trials in the spring. The feeling is that the new leadership in the MOD will favour the domestic models. Cyberspec wrote: I read that the Scorpion has passed the state tests and the Volk is due to undergo trials in the spring. The feeling is that the new leadership in the MOD will favour the domestic models. Like I said I'm neutral. I just don't want the Lynx to be discounted simply because it's 'foreign' and some people feel it's essential to breast-feed our own producers at every turn and give them every advantage, and all the time and resources they need to come up with their own competitive product - eventually. To be honest I suspect the Lynx vehicles will be given to the new military police force within the Russian military and used in areas where mines are a serious threat like the Caucasus and that the Russian military will get the Tigr-M and other Russian vehicles as a UAZ/BRDM replacement. I think mine protection is over rated... your enemies are not stupid and if it turns out a 6kg mine wont kill the crew they will just likely use more explosives in the next bomb so it will have a limited window of effectiveness... just like any other weapon. 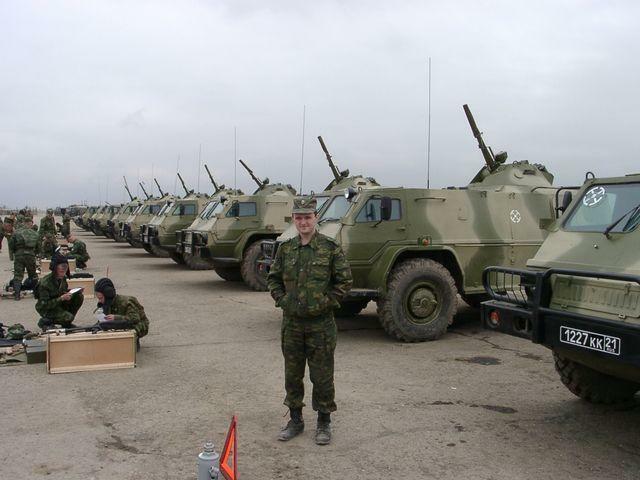 GarryB wrote: To be honest I suspect the Lynx vehicles will be given to the new military police force within the Russian military and used in areas where mines are a serious threat like the Caucasus and that the Russian military will get the Tigr-M and other Russian vehicles as a UAZ/BRDM replacement. Tigr has undoubtedly more mobility; but is that heavy-set chassis that is capable of climbing right over obstacles really needed in most places? The venerable UAZ which it may be replacing has no such capabilities yet was used very extensively by every branch of the Soviet & Russian military and was perfectly adequate for the tasks that it was needed for. The Lynx I don't think is inferior to the UAZ in mobility. NIZHNY NOVGOROD, February 22 (RIA Novosti) - The Russian Defense Ministry is interested in buying Russian-made Tigr (Tiger) armored vehicles, Deputy Prime Minister Dmitry Rogozin said on Friday. Different modifications of the vehicles exist, including those armed with antitank rockets that can effectively engage a superior enemy force as large as a tank company, he said. This particular modification is being developed by the Arzamas Machine-Manufacturing Plant in conjunction with the Tula-based KB Priborostroyenia [Instrument Building] Design Bureau. “We will show this machine at an exhibition in Nizhny Tagil. I think it will impress everyone - both our enemies and our state contracting authorities,” Rogozin said. He said it is wrong to buy 100-percent foreign-made military arms and equipment, because such policy is detrimental to domestic manufacturers and does not involve technology transfers. Rogozin also said the state will support private firms working under state defense contracts, adding that the relevant legislation is pending. The SPM-2 GAZ-233036 Tigr (Tiger) is a high-mobility multipurpose military vehicle manufactured by MIC, a GAZ Group division, at the Arzamas machine-manufacturing plant. It has a maximum speed of 150 kilometers per hour and can carry up to nine personnel or 1.2 tons of cargo. Finally Tigr future is secured. I think Lynx was just some kind of bribe to Berlusconi from Putin for God know what. Been wondering, what's the status of the Vodnik (GAZ-3937)?? Most of the photos I have seen of the Vodnik were largely FSB units protecting TOPOLs on the road, though I suspect a Boomerang might take that role in time due to its better armour and fire power. I also seem to remember a few in either South Ossetia or Abkhazia as well. Regarding Brigades/Divisions I suspect different sized units would have different advantages and disadvantages so some flexibility would be useful. With the introduction of all new armour and guided weapons the change in fire power and flexibility of a Russian Brigade will be going through some fairly significant changes, with guided artillery shells and the widespread use of night vision optics and day/night and all weather capable weapons like GLONASS guided artillery shells making artillery support far more effective as well as far more responsive and flexible. As shown in Desert Storm by the US forces with good mobility and good C4IR you can use a much smaller force to get the same job done, that doesn't mean of course that you don't ever need to use larger forces than Brigades. I'm pretty sure the strategic rocket forces operate them. I think there's only like ~30 Vodniks in service, so they're rare. I always have to laugh when I see Vodnik in video games being used as Russia's primary HMMWV. Traditionally it is the FSB that protects the nuclear warheads... though of course the space defence forces... now aerospace defence forces deploy the TOPOLs. GarryB wrote: Traditionally it is the FSB that protects the nuclear warheads... though of course the space defence forces... now aerospace defence forces deploy the TOPOLs. I think Russian strategic forces and aerospace are two separate things. Aerospace forces are still in the process of definement and we can expect some changes during that time. Well Duh... sorry my mistake... the space defence forces that have become part of the new aerospace defence forces don't operate TOPOLS... they operate the long range early warning radars and satellites... you are quite right Viktor. It is the Strategic Rocket Forces that operate TOPOL, but FSB still is tasked with the security of the nuclear warheads. GarryB wrote: Well Duh... sorry my mistake... the space defence forces that have become part of the new aerospace defence forces don't operate TOPOLS... they operate the long range early warning radars and satellites... you are quite right Viktor. If I remember correctly, that photo is from the south Caucasus region. The Vodnik was just a failed experiment it seems; it's amphibious ability or rather ability to get back on shore is decidedly lack-luster. Anyway most expensive version of Tigr vehicle is more than twice cheaper than Lynx. I think that says it all. Where'd this come from, details please. Its basically Tigr-M with enchanted protection.